It’s Tuesday and you know that on Wednesdays we wear pink. The mean girls want you to wear pink in order to get their nod of approval to sit with them at lunch. What if this was the way your skin cells operated on your face? The group of mean girl pores make the other pores wear pink, causing them to stress out, puff up finally turn into a blemish! Sounds stressful doesn’t it? Well, that’s actually what a majority of our every day busy lives do to our skin; cause drama. “Raise your hand if you’ve ever been personally victimized by Regina George.” You being Regina in this scenario, I bet a lot of your pores would raise their hands (That is, if we were to personify each pore on your face and give them little hands. That’s quite the mental image.) I’m also guilty of having bad skincare habits, an on-the-go lifestyle easily lends itself to personally victimizing my skin! 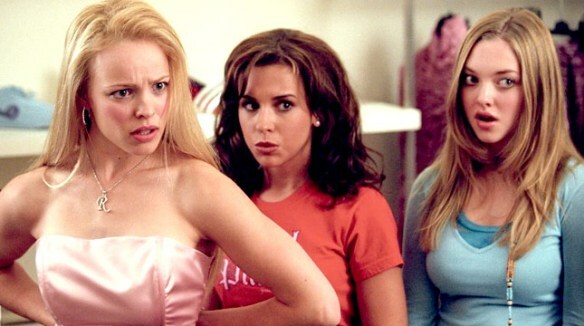 Here’s a list of Regina George-style bad habits that we all put our face through! Hopefully this will bring to your attention some of the unnecessary drama that we’re causing for our faces every day so we can start to take action in righting our skincare wrongs. According to a recent survey of women in the top U.S. cities, 50% of them confessed to not striving towards a healthy diet. This is causing thousands of women to miss out on foods that could do wonders for their skin and help fend off any Regina George-style pore victimization. Foods like salmon, walnuts and avocados are filled with excellent natural vitamins & antioxidants that detoxify your body and cleanse your skin. So, before you agree to those cheese fries, envision Regina getting taken out by a giant avocado instead of a bus and opt for a healthier option. While this is a bit dramatic correlated to the effects the elements can take on your skin, it isn’t too far off the mark either. Out of the Holistic Skincare Habits Across the Country survey results, 59% of the women surveyed are not actively trying to protect their skin from environmental elements such as sun & wind. I will personally attest to this habit in particular because I have sensitive skin and get my face burned or dried out very easily. Especially being in a bigger city and constantly being on the go & outside, I know that protecting my skin is important. Applying a daily moisturizer like the Simple Protecting Light Moisturizer with SPF 15 included has prevented my face many times from having its life ruined by the harsh elements. I always use this and a floppy hat so I can enjoy the pool and my face NEVER gets burned! 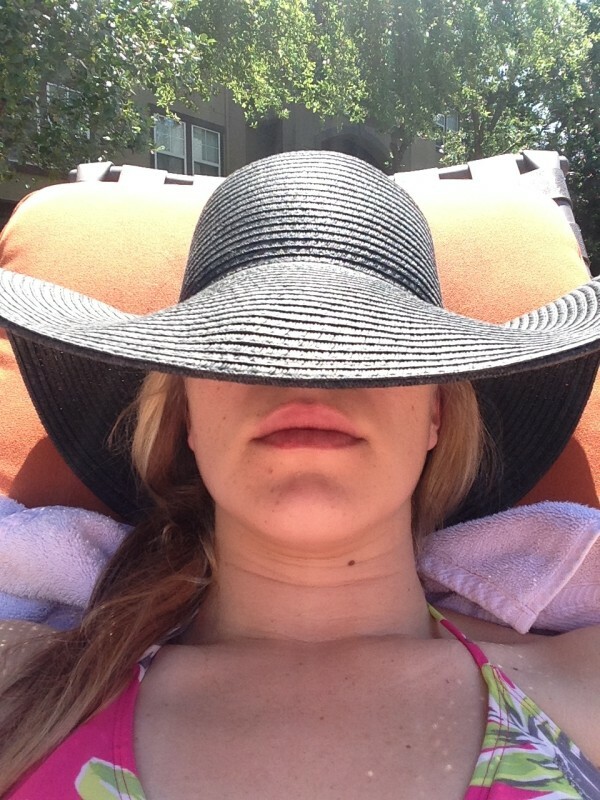 I put on the Simple® Protecting Light Moisturizer with SPF 15 & a floppy hat to protect me from too much sun at the pool. Of those surveyed, 63% of women in the top 40 cities nationwide know their stress levels directly affect the health of their skin. That’s a lot of potential Gretchen Wieners-style meltdown rants about stabbing Caesar. Before your stress levels get to a point of no return, take some relaxation time and unwind. Relaxing to combat your stress levels will help you unwind and make your skin less permeable to external factors like weather, makeup and Caesar stomping around smushing you under his big feet! All things that are bad for your face! Don’t be evil to your skin! Living in a hectic big city, it’s easy for me to get in a bad habit of just wanting to crash once I get home and know I should wash my face but just don’t want to take the time. However, that just makes me evil person number 1! I know the busy schedule of running errands and meetings that just took up my entire day and yet I decide to not take 3 extra minutes to give my face a little TLC! Just evil. If those arms we gave your pores earlier were long enough, they would probably want to punch you and it would not be awesome. I try to use at least one of the Simple cleansing skin care products before I go to bed each night and when I wake up in the morning. I like to keep it drama free by using the foaming cleanser in the shower because somehow I manage to get water and soap on every inch of my sink. I prefer to use that in the morning in the shower and eliminate the mess. Then use the cleansing facial wipes to wipe all the daily drama away from my face as part of my getting-ready-for-bed routine. These are my favorite Simple products & the skincare items I have managed to consistently add to my busy schedule. 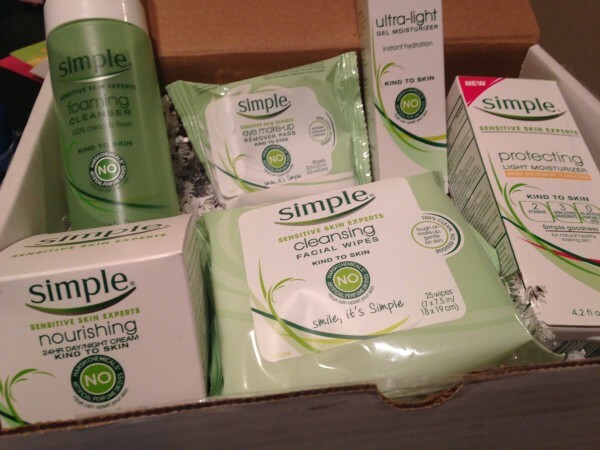 We’re excited to partner with Simple Skincare to bring you this amazing giveaway! Want to enter to win this set of Simple® Skincare products, a $55 value? Comment below and let us know what you think your worst Regina George-style skincare habit currently is. We’ll pick a lady in need to receive this complete Simple® Skincare line to help her star righting her skincare wrongs! 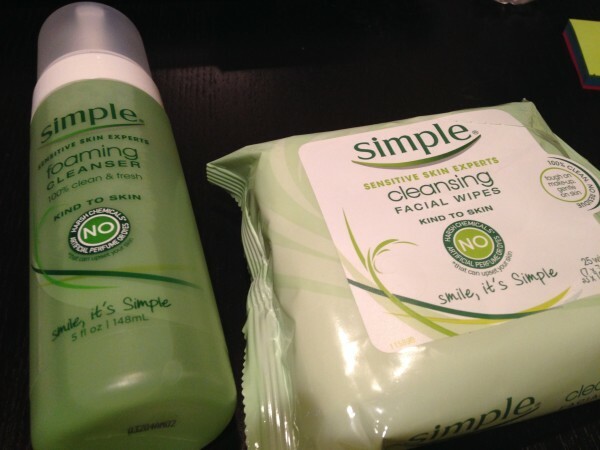 The Simple® Skincare giveaway is full of great items for anyone to integrate into their everyday routines. Simple Nourishing 24-Hour Day/Night Cream, Simple Foaming Facial Wash, Simple Eye Make-up Remover Pads, Simple Cleansing Facial Wipes, Simple Protecting Light Moisturizer with SPF 15 and Simple Ultra-Light Gel Moisturizer. love every single thing on this post! i love how you use Mean Girls quotes and related them to skin care. Genius! #3: Stress is probably my worst habit. I don’t take the steps I need to in order to relax and unwind. ProbablyRachel I absolutely agree. It’s one of those non-tangible items that you don’t realize until it is almost to the breaking point! Check out my Sunday smile strategy post. It has a couple ideas that are meant for de-stressing while also being productive. My issue is that I hate feeling like I am not being productive. My worst habit is picking at my face instead of leaving it alone. It ends up just leaving a scar that I need to then treat. I always pick my face. It’s hard not to! I touch my face, which gets the oil and dirt from hands on it. WillowMoon I do the same thing. My hands are CONSTANTLY on my face. Wish I knew how to break that habit. Ya know? DarleneCarbajal1 my best friend always does the same thing. I give her lectures every time about how that is so bad and it will just leave a scar! :) I totally understand why it is hard not to, though. I agree with everybody else. My worst habit is that i touch my face a lot. My worst habit is forgetting to remove mascara at night.Raccoon eyes in the AM is not a pretty sight. I always pick at my face and forget to remove mascara! Such bad habits that I need to get rid of! P.S. This is a GENIUS sponsored post! My worst habit is pitching blackheads. I like to keep a clean face. Not washing my makeup off before going to bed. Worst habit is picking at my face. Not removing eye make up before bed. My worst habit is touching my face too often!